While recently bringing my large work vessel back to Oahu, I was trolling a couple 30 wide reels for wahoo or mahi mahi. This vessel is definitely not a fishing boat in any regard but of course I have to troll lures where ever I go just in case! As luck would have it I hooked something a little bigger which almost spooled me on the first run. 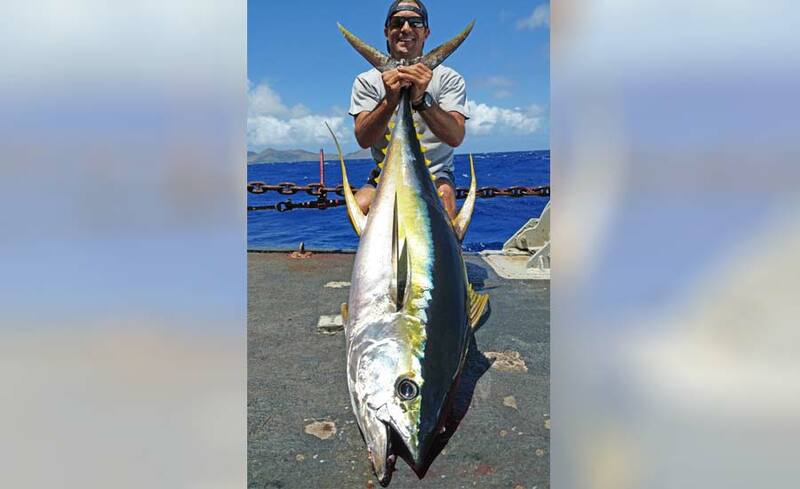 Because the boat is 85 feet long, not very maneuverable and high out of the water it became a bit of a challenge to fight this fish effectively. When the 300 lb Black Magic trace got within reach, I decided that regardless of the outcome I was going to hang on because the mainline was getting pretty tired and the conditions were worsening. On the first circle the fish got its head lodged under the transom and since I was totally committed to hang on, I was expecting the trace would part. To my surprise, the fish came out and did another large circle before accelerating forward and getting hung up in one of our large corner anchors that hang right at water level. Surely this would be the kiss of death with the amount of tension on the trace but still the fish remained attached and the third time around I managed to get a gaff into it. While it was not a huge yellowfin, it was a real challenging catch for me given the circumstances and obstacles and a fish that should have gained its freedom many times over had it not been for the brutally strong Black Magic trace.